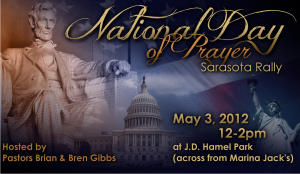 We want to invite you to the annual National Day of Prayer Rally being hosted at J.D. Hamal Park on May 3, 2012 from 12 to 2 PM. 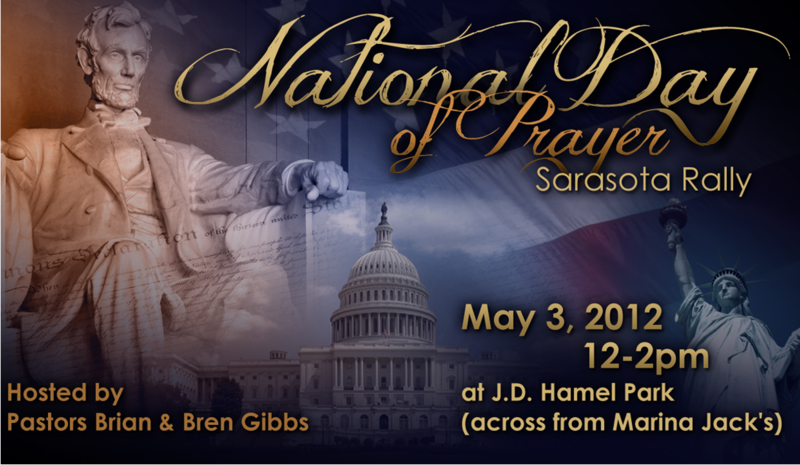 Join with hundreds of passionate Believers, City Leaders, Official, Pastors, Ministers, intercessors and those who love our nation and the city of Sarasota. As American troops stormed the beaches of Normandy, President Franklin Roosevelt called for our nation to unite in prayer. He also offered a prayer to prepare each citizen for the road ahead. “Let our hearts be stout, to wait out the long travail, to bear sorrows that may come, to impart our courage unto our sons wheresoever they may be. And, O Lord, give us faith. Give us faith in Thee.” The victory that followed on June 6, 1944-also known as D-Day-began the march to Berlin. Eighteen months later, WWII was over and one of the world’s greatest evils had been defeated. The prayers of a nation had been a powerful force. Prayer has always been used in this country for guidance, protection and strength-even before we were a nation or a handful of colonies. The Pilgrims at Plymouth relied on prayer during their first and darkest winter. Our founding fathers also called for prayer during the Constitutional Convention. In their eyes, our recently created nation and freedoms were a direct gift from God. And being a gift from God, there was only one way to insure protection-through prayer. President Abraham Lincoln knew this well. It was his belief that, “it is the duty of nations as well as men, to owe their dependence upon the overruling power of God.” When it came to the fate of the nation, he practiced what he preached. Before the battle of Gettysburg, he turned to God in prayer. “I went to my room one day and I locked the door and got down on my knees before Almighty God and prayed to him mightily for victory at Gettysburg.” Won by the Union, Gettysburg was one of the turning points in the war that ended slavery and kept the states united. Today the need for prayer is as great as ever. Our nation again faces battlefields, along with an epidemic of broken homes, violence, sexual immorality and social strife. As the heroes of our nation did in the past, we must again bow our heads in prayer. We must ask the Lord to bless our leaders with wisdom and protection, and that we will have the fortitude to overcome the challenges at hand. If Roosevelt, the Pilgrims and Lincoln never underestimated the power of prayer, neither should we. J.D. Hamal Park is located at the corner of Main Street & Tamiami Trail downtown, Sarasota. ** We encourage all attendees to take advantage of the Marina Jack Parking Lot on Tamiami trail. The Parking lot is right across the street from J.D. Hamal Park.